BEDFORD, Mass., Jan. 30, 2019 /PRNewswire/ — Having already changed the way people clean with the iconic Roomba® robot vacuum and Braava® family of robot mops, iRobot Corp. (NASDAQ: IRBT), the leader in consumer robots, is reinventing how people care for their lawn with the Terra™ robot mower. Terra™ features state-of-the-art mapping and navigation technologies, high-performance, high-quality mowing, and easy installation. A video and photos of the robot were unveiled on iRobot.com today. Terra is unique because it learns its environment using iRobot’s Imprint™ Smart Mapping technology. It mows like people do, intelligently navigating a yard cutting efficiently in straight, back-and-forth lines. Terra remembers where it is in the yard and where it still needs to cover. If the robot’s battery runs low, it will return to its base to recharge and then resume mowing until the yard is complete. Terra will offer consumers a welcome alternative to existing robotic lawn mowers by eliminating the need for costly and labor-intensive boundary wires. Combining Imprint™ Smart Mapping technology and a newly developed wireless communications system, including standalone beacons, users just place the wireless beacons around their yard, drive the robot once around the perimeter, and schedule Terra to mow. Users have total control over where the robot goes and where it doesn’t go, so it will stay on the lawn and out of the flowers. The iRobot Terra robot mower will be available for sale in Germany and as a beta program in the U.S. in 2019. Specific availability and pricing will be announced at a later date. 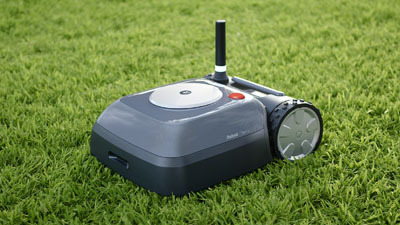 Please visit www.irobot.com/robot-lawn-mower for more information. Dieser Eintrag wurde veröffentlicht in General, Hardware und verschlagwortet mit irobot, Robot Mower, Terra von Sebastian Trella. Permanenter Link zum Eintrag.